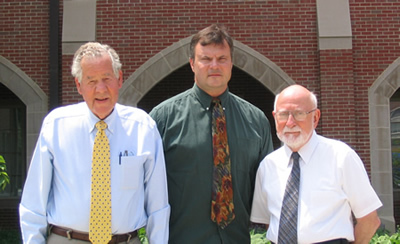 From left to right: Dr. Richard Hansler, Mr. Vilnis Kubulins and Dr. Edward Carome. There is strong evidence that providing the brain with melatonin is beneficial in delaying/preventing cognitive decline. There is also clear evidence that even moderate levels of light, especially blue light, can suppress evening/nighttime melatonin production. There are light bulbs available that don’t make blue light and glasses and filters available that block blue light. Their use will restore melatonin production. Maximizing melatonin production by the pineal gland is more effective than taking melatonin by mouth because of the direct connection from the pineal gland to the brain. A regular schedule for getting up, exposing the eyes to light, eating, exercising, putting on orange glasses, and going to bed is likely to improve chances for avoiding mental decline and Alzheimer’s disease. This life-style will also improve your sleep and reduce your risk for diabetes, obesity, heart disease, and breast, colon and prostate cancer.